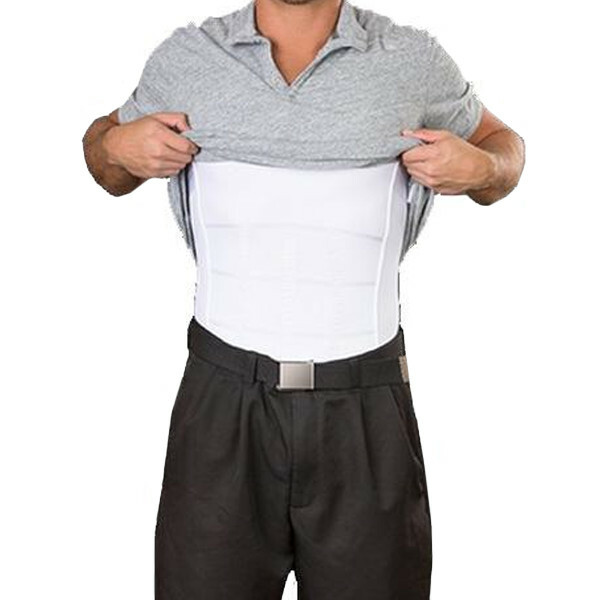 This revolutionary new Men's Body Shaper, designed specifically for MEN, to give a Firm, Slimmer and more Desirable look, is a must for all Men!! Make your clothes fit better !! Increase your confidence with a reduction of up to 2 waist sizes, as well as improved posture and more defined upper body. The Front of the vest contains 12 Engineered spandex structures, which hug, form and shape the front of the stomach area forming a desirable firm and flat surface. This gives the user an athletic, flat and slim look, and can reduce waist size by up to 2 Sizes!! The upper area also shapes the top of the chest giving a shapely and firm front look. The Nylon + Spandex engineered combination, ensure comfort and Manoeuvrability as well as a figure shaping, further nobody will realize you are wearing one !